My first open race. My first introduction to real speed. Real racing. And it got off to a great start. Almost missing the A4 group going off while getting stuck behind some A3 guys waiting. 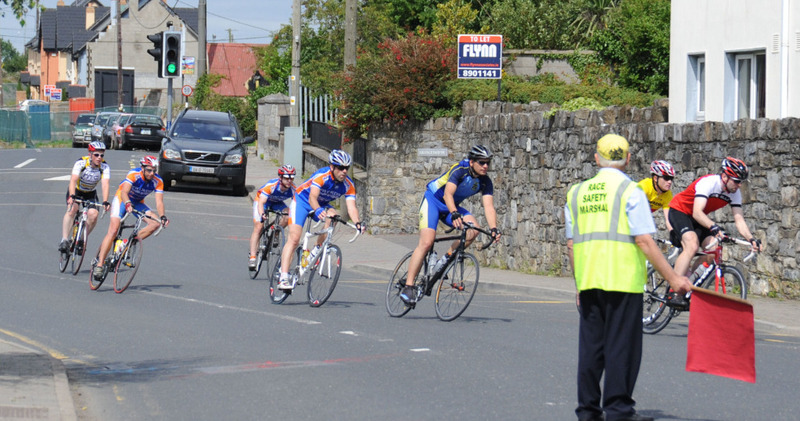 Luckily the race was neutralised out of the village allowing us to catch back on the group before the speed went up. Not a good way to begin. Pace did stay easy enough through the first lap although it did take some time before the pace line properly started and go settled. First time up the hill, another rider from another club moved to the front and looked like he was trying to pull out a gap. Being near the front I sat on his wheel and let the group behind pull up. We did loose a few during this ascent too, and I learnt after that quite a few burnt off on this lap. Going on my experience last Wednesday, as soon as we were over the last hill I moved right the way to the front and took a wide line to go around at speed. This placed me second back from the front at the beginning meaning I was hanging on right the way down through the fast section. 1 Down, 2 and a half to go. For this lap the pace went up quite a bit, at least subjectively. We pulled time out on the A3 group too during the lap so I guess things were really faster. The pace line worked quite well with most people taking turns although it did accordion a bit during the fast sections. For the second time up the hill I stayed near the back and sat in a much a possible. I knew it wouldn’t break apart this time so better to conserve energy. With a repeat of the last lap at the top, I rounded the corner at speed and held on down to the village. During the third lap, things slowed down quite a bit. I’m not totally sure why but at some point people stopped working and the line strung out, but not at a slow enough speed that you could safely move from the middle of the line to the front to take a turn. On the hill I sat near the middle but close enough to the front to see where people were. 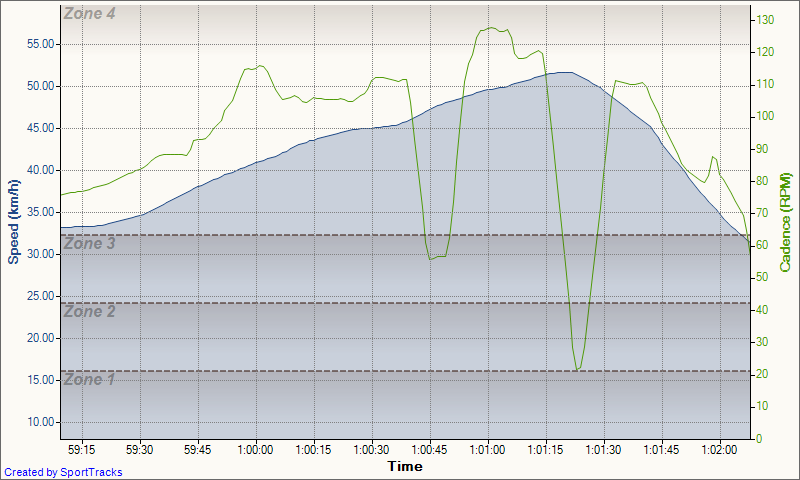 Same again over the top and around the corner where the pace went up a bit. Took some effort to stay on wheels although I was about 5th back. The gap did grow a lot more than I wanted during the descent and once again confirms I need a standard chainset for next season. Once again things slowed after leaving the village on our last lap, but this time they really slowed, enough to let the A3 catch us. Attacks started quickly now. People going quick and fast but without any real presence. When nearing the end of the road, three guys got away. Then a forth went. It looked like they were going to hold it and stay away until the corner so I went and sprinted up. Mistake number one. Gap was only maybe 5 seconds off at this point however we were chased down by the corner and the group bunched during the first little hill around the corner. After coming around the little descent, I moved near the front and ended up right on the front. Even with slowing down, people weren’t coming around. It took about 30/40 seconds before someone pulled up beside me on my right but not past. Mistake number two. Leading the group up the hill isn’t the smartest thing I’ve ever done and I was about to pay for it. It stayed this way until just after the crossroads when the first real attack started. Try as I might, I didn’t have the pace to stay with them however they soon started burning out. Another one went and again I was near the back of it. As it started slowing again, I got boxed in near the left hand side of the road. Mistake number three. Somehow I managed to slow and go all the way across the road to the right and sprint up clear of those who had just burnt out. However I still maybe 20 odd back at this point. And having to sprint across the road to get space didn’t help. Too little to late, or too much to late. When the last attack when, I’d used too much to really sprint to stay on them. I did hold a decent pace and passed a few riders in the last two hundred metres, but not as many as I should have. Each person ahead that burnt out was enough to let me go by without upping my pace. Finished maybe top 15 although I should have done better had I raced smarter. Lessons learnt. It now marks two races were I blew apart on the hills. All my training for the Marmotte has paid some dividends in making me strong on the hills, but I really don’t have it when the sprints go. Something to work on for the winter.